Following on from Mike's successful debut excursion on the label last year with the Set in Motion EP, the talented Australian producer teams up with one of the worlds leading female trance vocalists - Elles de Graaf for his latest release. Mikes production oozes class whilst the vocal performance is delivered with style and intensity that locks you in from the very first word. Martin Roth guides the track expertly into deeper territories whilst Ian Betts delivers the more trademark Discover sound with his dubbed interpretation. Each mix has a dub for those of you that prefer instrumentals and we finish off with the original radio edit for those of you that like to get there a bit faster. 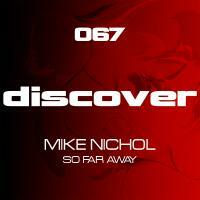 'So Far Away' is available now from Beatport and iTunes.